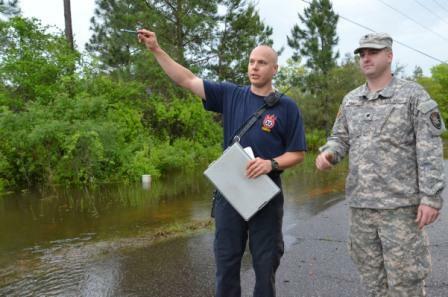 SANTA ROSA BEACH, Fla. (April 30, 2014) – More than 75 members of the Florida National Guard responded to assist with flooding in Florida’s Panhandle on Wednesday, including working with civilian first-responders in areas flooded during recent storms. 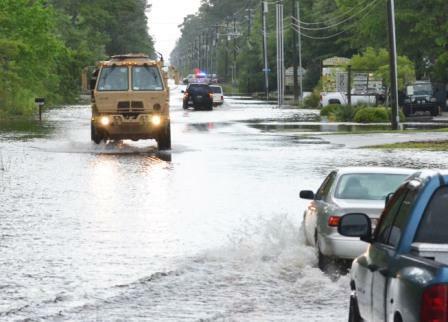 Soldiers from the 144th Transportation Company and the 779th Engineering Company arrived in Escambia, Santa Rosa and Walton Counties with 24 high-water trucks and other support vehicles Wednesday afternoon at the direction of the Florida Division of Emergency Management. Spc. James Knight with the 114th Transportation Company was one of the Soldiers assisting local law enforcement and emergency services Wednesday evening, driving members of the local fire rescue through flooded neighborhoods and roads in the Guard’s five-ton trucks. “We can go a lot of places that they can’t, and can carry any people and equipment that they might need in those areas,” Knight, who was one of the more than 50 Soldiers assigned to vehicle support, explained. On Wednesday morning Florida Gov. Rick Scott declared a state of emergency in 26 Florida counties due to recent inundations of torrential rain. 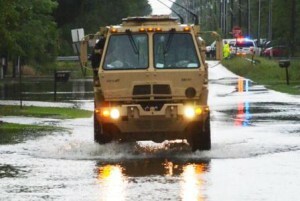 Currently the Florida National Guard can mobilize around 9,000 personnel to perform a range of emergency management services from search and rescue, to area security and logistics support. Their essential tasks under the direction of emergency managers are: protect life and property; maintain peace, order and public safety; and provide support to local, state and federal emergency responders.